This was done at the Baltimore Tattoo Convention 2014, and it was this client's first tattoo! She was specific on wanting a more realistic approach to the project, which required a certain size for the details to do well. She was a trooper for this, and sat for about 6 hours if I remember correctly. I am usually doing full color tattoos, but I was very pleased to do this one in black and gray, and loved how it turned out! 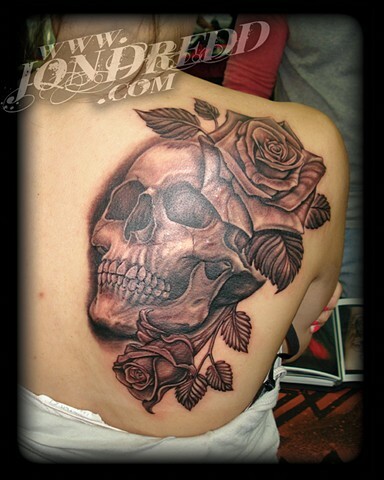 Skull tattoos are always cool!